Farid al-Atrash and Issa Amro want an end to Israel's illegal settlements. For 50 years, Palestinians have suffered immensely under Israel's occupation. Rampant discrimination, restriction on movement, dispossession of land and the demolition of homes to make way for Israeli settlements are routine. Dedicated to non-violence, Farid and Issa are bravely defending the rights of Palestinian people. They speak up despite constant threats and attacks by Israeli soldiers and settlers. Issa works with Palestinian youth to help them find peaceful ways to protest. For his human rights work, he's been arrested, blindfolded and beaten by Israeli authorities. Farid, a lawyer who exposes human rights abuses faces similar harassment by authorities in an attempt to silence him. In February 2016, Farid and Issa joined a peaceful protest marking 22 years since Israel closed a main street in the city of Hebron to Palestinians. Hebron's 200,000 Palestinians are effectively trapped between the road closure and the Israeli settlers who now live there. Farid and Issa now face a list of ludicrous charges for taking part in the protest, clearly designed to obstruct their human rights work. Both men have vowed to keep defending the rights of their people. Will you stand with them? Join our call on the Prime Minister of Israel to drop all charges against Issa and Farid immediately. 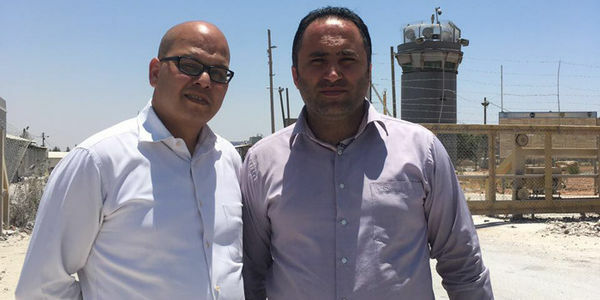 I am very concerned for Palestinian non-violent activists, Issa Amro and Farid al-Atrash, who are facing charges for their protest against Israeli settlement. I call on you to immediately drop all the charges against Issa and Farid and investigate their claims of ill-treatment by the Israeli security forces, and prosecute those responsible. Please end the harassment of Issa, Farid, and other human rights defenders in the Occupied Palestinian Territories.